As you can see I am taking us up a step this time around. So hear me out if you really want to see what I have in store for everybody with this WhoRunPhilly2K stuff. I’m going to need y’all to take this step with me. I Agree, you might think you not good enough to actually win. But I promise you that you don’t see the vision yet of what I’m trying to show you. I want the impression to be something of a monthly competition. The Tournament Experience is what I going to use to give you that “WOW” feeling. Just think Bigger Facility, Better food, Entertainment, Other mini tournaments day of, etc. Trust me I have something special planned with this movement but we will have to move up to this new level of money to do that. But you know what though the funny part is I believe that most of you who holding back from coming to the tournaments is probably better then 90% of the people that be coming. Crazy right, I know you reading this saying “ So you mean to tell me Jim that I am literally missing out on so much money right now by not Signing up?” — That is exactly what I’m saying. I cant stress it enough everybody got they own way of playing this game & I have seen everybody I thought was unbeatable lose in my tournaments. Then mind you my rules are set a way of giving the first timer a advantage to win not to the better player. My Same Team & Coin Toss rules are prime examples of that. We bringing 2019 in the right way with these first two tournaments. But if there is anything I want you to get from this letter is don’t think you have to Win to have a good time at my tournaments I am going to give so much more inside the event that the grand prize will come second to that. Also, you can “Win” my tournaments everybody is not as good as you think in 2K. 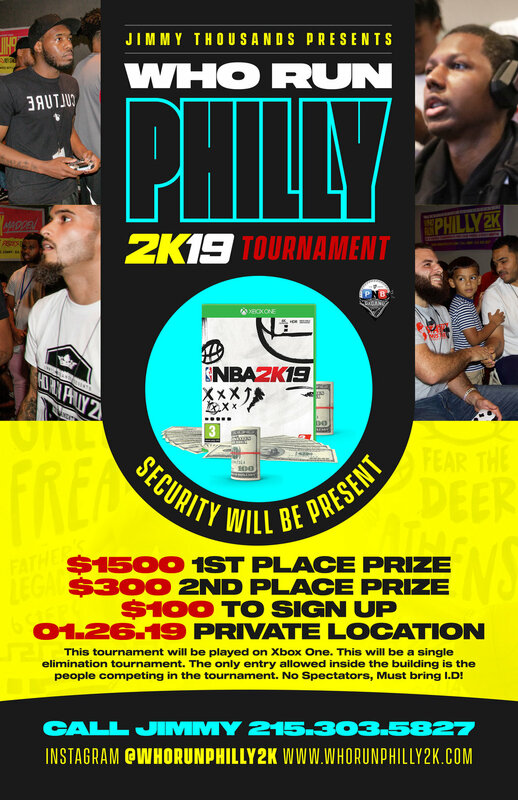 I’m rapped out, but trust me if you want to see the real vision of WhoRunPhilly2K fill this tournament up fast for me & I will show you. Because at this level I can give you so much more. P.S. - Oh yea I didn’t have the November 24th tournament because I actually needed some time away to focus on some personal stuff. I never really tell y’all much about my personal life through these newsletters but I am heavy into learning about investing in real estate and I had just got my first rental property under contract. Now that I got that behind me its time to comeback strong & I need everybody support to do that. I Have The PS4 Controller Adapters for the Xbox One. So you can use a PS4 controller at the tournament.